The average price for this game in the past 6 months is $19.49. The game first became 50% off on Dec 9, 2017 at Steam Store. Lowest historic price was $16.86 on Nov 25, 2018 at WinGameStore. Amazing deal from WinGameStore as they are offering Fallout 4 GOTY for only $17. If you're watching Fallout 76 streams and think the game is a joke, circle back to a better installment here (just ignore the settlement part of the game). Includes all expansion such as Far Harbor, Nuka-World and more. Historic low price, Steam key. GMG has kicked off their giant Summer Sale and today's featured 24 hour flash deal is historic low price on Fallout 4 GOTY. If you've never picked up Fallout 4 because you slept through 2015 (or you were uh, at an inappropriate age) - this is your chance to grab the entire content for $24. Steam key. Fallout 4: Game of the Year Edition is out just yesterday. Includes the base game along with all six add-ons. 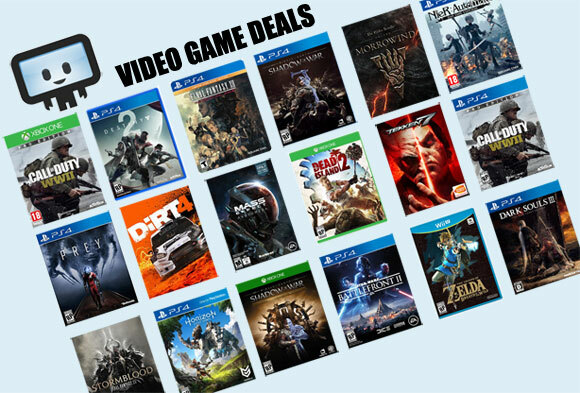 GMG has a 20% off instant savings dropping the price to $48. The average price for this game in the past 6 months is $28.56. The game first became 50% off on Jul 25, 2018 at Green Man Gaming. Lowest historic price was $24.60 on Mar 1, 2019 at Green Man Gaming. Fallout 4 VR hits lowest ever price of $33, taking the still-the-latest Fallout title by 45% off. While this is noteworthy in that it's a new historic low price, we really don't think $33 is worth it for an almost 3-year-old game - but if you've never played Fallout 4 before (somehow) and you just started on PC gaming with a VR rig... then maybe? Is VR in your PC gaming future? If so, Betehsda's Fallout 4 VR is out in October and now 21% off after coupon at GMG. Coupon discount only good through the weekend. The average price for this game in the past 6 months is $12.01. The game first became 50% off on Mar 22, 2016 at Green Man Gaming. Lowest historic price was $7.65 on Aug 24, 2018 at Razer Store. Missed the flash sale on Fallout 4 from Razer Store last month? GamersGate has Fallout 4 for only $9 during their Bethesda Sale. While we think the game has many problem points (eg settlement attacks that never ends and typical silly Bethesda bugs), you're doing yourself a disservice by not having this in your Steam library. It took awhile but fallout 4 is now finally under $8. This is a new historic low thanks to a Bethesda Publisher sale at Razer's Game Store. Stack in the single-use 10% off coupon and the Steam copy will be 74% off. DLCs and Season Pass also on sale, but in our opinion if you've never play Fallout 4 until now - you don't really need to splurge for additional content. Lowest price on Fallout 4 for PC at GamesPlanet in a new flash sale. The price will show as £6.29, but you can buy world-wide which in US Dollars comes to about $8.02. Fallout 4 on PC drops to its lowest price ever as a Star Deal at Fanatical. For the next 48 hours pick it up for only $8.79. Still haven't tried Fallout 4 and you're missing out from all the settlement-under-attack memes? $13 gets you quick access to a relatively decent title from Bethesda. Steam key. The average price for this game in the past 6 months is $15.00. The game first became 50% off on Mar 24, 2016 at NewEgg. Lowest historic price was $10.91 on Nov 15, 2017 at GameStop. Fallout 4 on the Xbox One slashed to $15 after coupon at NewEgg. Oddly this deal is not reciprocated for the PS4 or PC and is Xbox alone. Ties its historic low of $15 which was last seen about Thanksgiving Thursday 2016. This week Fallout 4 on the Xbox One is down to $20 at Best Buy. Oddly the PS4 version is priced at $30. A somewhat rare sale price. Fallout 4 slashed to $15 at the Microsoft Store today. Physical disc copy with free shipping. As cheap as it'll get on Black Friday. Fallout 4 ties its all time low at NewEgg on the Xbox One and PS4 with a coupon code drop to $25 + $3 shipping (ties all time low even after shipping). Last time we saw it this cheap was June 9th. Fallout 4 on the Xbox One slashed from $40 to $20 at Dell Home. Shipping is surprisingly free, which you wouldn't find at this price point from the big box retailers like Amazon or Best Buy. The average price for this game in the past 6 months is $28.33. The game first became 50% off on Nov 22, 2017 at Microsoft. Lowest historic price was $24.99 on Feb 20, 2018 at NewEgg. The average price for this game in the past 6 months is $14.99. The game first became 50% off on Mar 24, 2016 at NewEgg. Lowest historic price was $10.91 on Nov 8, 2017 at GameStop. Don't care for Fallout 4's GOTY edition because you won't spend time on the DLCs and expansions anyways? You're in luck because used copies are only $10 at GameStop. Fallout 4 on the PS4 and Xbox One hits its all-time low at Best Buy. Free store pickup or free 2-day shipping. Pre-owned condition for Fallout 4 is $30, while brand new down to $20. Best price ever for a new conditioned copy of Fallout 4 on the PS4 at GameStop. Funny enough GameStop is charging $30 for a pre-owned copy and $60 for a download code. Fallout 4 is now finally only $25 at Best Buy, eligible for GCU too which will bring it all the way down to $20. Deal is available on Xbox One and PC DVD copy too (which will have a Steam key inside). Store pick up is free if you have one nearby, or spend more than $35 to get free shipping. Fallout 4 on the PS4, Xbox One, and PC physical disc down to $24 after coupon at NewEgg. Though not a new low on the other consoles, this is cheapest ever for the PS4 version. The average price for this game in the past 6 months is $27.49. The game first became 50% off on Dec 17, 2017 at NewEgg. Lowest historic price was $27.98 on Feb 20, 2018 at NewEgg. Fallout 4: Game of the Year Edition dropped to $30 today at Best Buy. If you haven't tried Fallout 4 out yet, might be worth picking up the GOTY this week with all the DLCs release. GCU members gets an additional 20% off which cuts price down further to $24. The average price for this game in the past 6 months is $19.76. The game first became 50% off on Jul 18, 2018 at Green Man Gaming. Lowest historic price was $14.02 on Nov 21, 2018 at Green Man Gaming. If you've never bothered with Fallout 4's pricey Season Pass, its now at a new historic low price of only $20. Even though the game had a price increase to $50 long ago, the Season Pass has never dropped below the $21 mark. Deal is limited time as the extra 20% off coupon has an unknown expiration date. Fallout 4 Season Pass simply doesn't get enough discount love in the past year. GamersGate aims to change that during their week-long Bethesda sale with a price cut down by 51%. Steam key. For those that missed the 50% off deal on Fallout 4 Season Pass from GameStop last week (yes, before Black Friday) - how about this 49% off deal from GMG instead? Ends next week. Steam key. Once in a blue moon, GameStop comes out with ridiculous good price that blows all other digital retailer away. This is one of them. Fallout 4 Season Pass is now 50% off for $25, one of the lowest its been since the price hike in March earlier this year. Remember last year when the Fallout 4: Season Pass was selling at a discount under the $29.99 list price? We haven't seen the old under $30 discount since March of this year, but now she's back. The Fallout 4 Season Pass slashed to $26.79 at GMG. Lowest price since Bethesda raised the list price to $49.99 earlier this year.